Today is a Special Day. 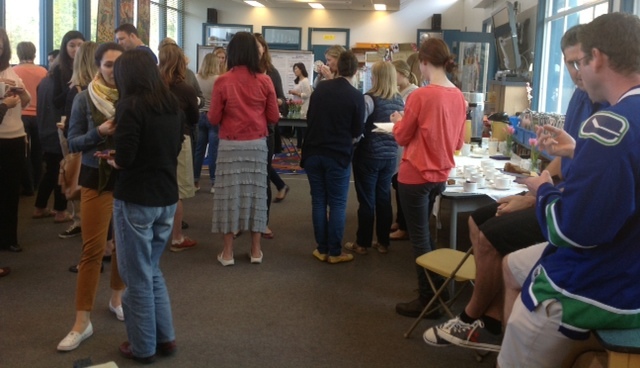 Today our staff celebrated our Ridgeview parents with a Parent Appreciation Tea. We have a very involved and active parent group at our school. This year, through their fundraising, our RPAC has already generously sponsored our school’s Cultural Events (such as “Axe Capoeira” which we saw at the end of March) and the “HighTouch HighTech” Science programs. They are also subsidizing the Hip Hop Dance program Ridgeview students are receiving this week. As classroom teachers, we receive annual funds from the RPAC to use for stickers, toys and games, books, decorations and special Science and craft supplies. We’re grateful and appreciative of our PAC’s generosity, as our students are able to enjoy participating in activities, and we are able to supply our classrooms, in a manner that otherwise may not have been possible. So to all our parents, we say “thank you.” We appreciate not only the time you volunteer at our school as part of the PAC and helping out in our classrooms, but also all the unspoken hours at home supporting and guiding your children to become the best learners they can be. It is a privilege to be able to teach your children in Kindergarten, and a pleasure to work with you as a partner in your children’s education. We truly appreciate you!